Corsa Performance 14436 - Corsa Challenger 5.7L AUTO Xtreme Cat-Back with Dual Rear Exit and GTX Style Tips; 2009-2010. 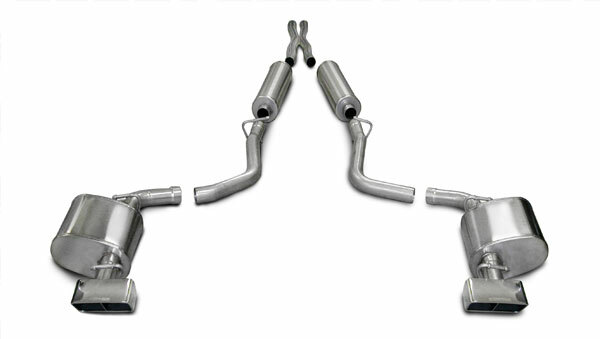 CORSA RSC XTREME exhaust system is best suited for people who want the louderst corsa has to offer. There is no drone with the CORSA exhaust system because the CORSA exhaust system uses RSC technology to eliminate problem frequencies that cause interior drone/resonance at cruising speeds. CORSA&apos;s Dodge Challenger exhaust system features a patented non-restrictive Straight-through design reduces back pressure and frees up additional power resulting in improved horsepower and torque. As an additional bonus, your Dodge Challenger can result in greater fuel economy because of less back pressure and more power.